Crossovers are huge business these days, especially with a growing number of hybrids in the compact crossover class. While Mitsubishi might not have as strong of sales as the big players, it certainly gets a step-up on the competition with its Outlander PHEV compact crossover. The big difference: the Outlander PHEV runs solely on electric power for the first 22 miles. After that, the gas engine kicks in and you keep driving on. The Outlander PHEV managed 35 mpg during a week of driving. It would’ve done even better, but I left the charger at home during a long trip. Usually that means once it’s out of juice, it’s gas only. One difference with the Outlander PHEV is charging on the go using the gas engine. A nice feature that many plug-in hybrids don’t offer, but should. When I did remember the plug, it takes about eight to 10 hours to fully charge with the regular power outlet. This tester had the DC Fast Charge capability, which promises 25-minute charging. I’ve driven other gas engine Outlander models in the past and found them slow and underpowered with the base four-cylinder engine. But the PHEV model combines the gas engine and electric motor to produce about 190 hp, which is a healthy bump. This Outlander PHEV keeps up with traffic much better than the gas-only model. The Mitsubishi has AWD, so this compact crossover handles most weather conditions without issue. It might be pretty good off-pavement, as well, since the AWD system seems very sophisticated. The handling isn’t as good as some others in this compact crossover class; this Outlander responds best to easy driving and would rather not be pushed in the corners. There are two trim levels of the Outlander PHEV. One version starts around $35,000, but I drove the GT trim level for close to $43,000. That is a premium in the compact crossover class. Mitsubishi has upped its material quality, as well. The materials are nicer than before, with more soft-to-the-touch areas than I ever remember. It’s a step-up but still not as nice of an interior as some of the small crossovers in this class. Other Outlander models offer seating for seven; the PHEV seats five. The batteries raise the rear floor so the third row doesn’t fit. While the third row was nice for this class, the Outlander PHEV seems almost spacious without that extra row. Seats are a bit firm, as is the rear bench seat, but not uncomfortable. I had no problem on longer trips. Rear cargo space is good for this class, especially if you fold the rear seat flat. The lift up isn’t high, making loading very easy. A 7-inch touch-screen works the first time to the touch. The sound system is very loud when turned up, but not as clear at that highest volume. 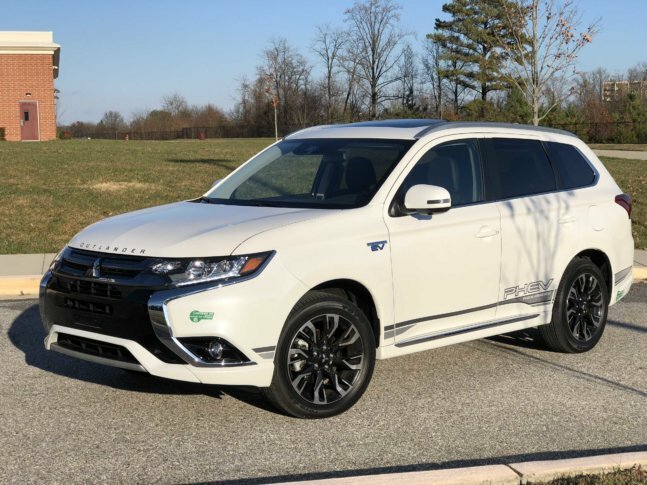 When you look at the Mitsubishi PHEV, it doesn’t scream plug-in hybrid, it just says so subtly with a few small badges and an electric-plug door on one side. A few optional decals on the side of the Outlander allow you to say it louder, if that’s your jam. Different wheels and LED lighting are some additions to the exterior of the Outlander PHEV that seem to give it a more modern look. The styling is still on the conservative side but the new front-end styling which is about 2 years old is the most expressive styling in a while for Mitsubishi. The Mitsubishi Outlander PHEV is a unique compact crossover in a hot market. Mitsubishi is seeing improved sales, as this Outlander is a much more competitive, small crossover that just happens to not use that much gas.